A cute disney character figurine. 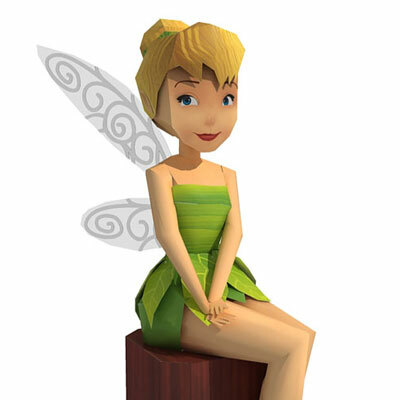 It's tinker bell by Julius Perdana. Talking about Disney, I have found many craft on the subject. There are mostly the characters in the movies that are made into paper model, doll, stickers, coloring sheet etc. Need more animal paper toy? Include this cute penguin into your animal craft collection. 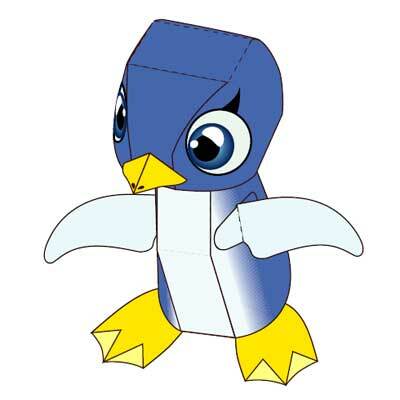 It looks like a baby penguin to me but blue seems weird. This papercraft was made in 2006. Yes, such an old art work but it is worth sharing. It's not like we would across such a cute animal every time. Anyway, it's a product by Ryo Tokisato and I have featured many of his works here. Just explore the site to look for them. As I have told you, 2013 is year of snake, so enjoy this snake paper toy by Hideo Tsuchiya. The snake is actually a simple one. There are no complicated parts because it's only a piece of paper, cutting it in spiral and spring it up to form a figure. Oh well, I do not know if there is anyone who will have this as decoration and snakes in general creep me out. Imagining this reptile wraps over me can already give me a cold sweat. There it is, a new paper toy by Ryo Tokisato. 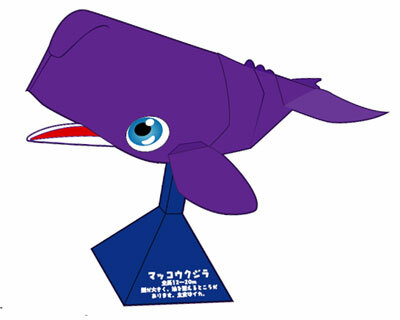 A blue / purple color whale is up for your collection. But before I go on further, i want to take this chance to wish you all a happy new year. It's a new beginning, so wish you guys good luck and wonderful 2013. I should have looked for snake papercraft instead of the whale but I will update with a new one addition later on. 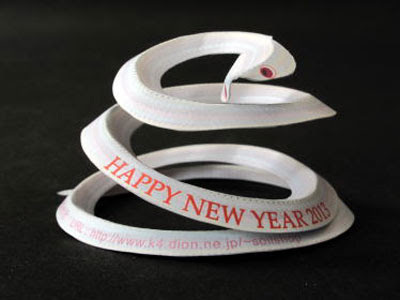 Yes, because 2013 is year of snake looking from eastern calendar. Anyway, the whale that I present today is from sperm whale family. Its name derives from a milky-white waxy substance, spermaceti, found in its enormous head. Oh well, you can google up for more info from wiki on sperm whale.